Edge of Heaven is a new six part ITV comedy drama series which displays life at Margate’s finest , and only, ‘80s themed B&B, run by the chaotic Taylor-Chatterjee family, Wham!-loving Judy and her black pudding enthusiast Husband Tandeep, and her grown up children, demobbed soldier Ann-Marie and Alfie, whose life is going badly ever since his fiancée Carly left him at the altar. Edge of Heaven is a Hartswood Films production for ITV, and is produced by Elaine Cameron (Sherlock, Jekyll) and Paul McKenzie (Sadie J, Dani’s House). The series was written by Robert Evans (Stella), who also stars in the sitcom. 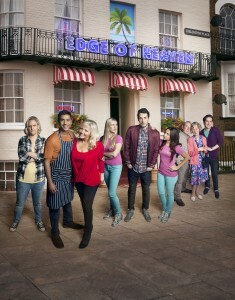 The comedy will feature Blake Harrison (The Inbetweeners), Justine Michelle Cain (Some Girls), Camille Coduri (Doctor Who), Nitin Kundra (Steel River Blues), Laura Checkley (Rosemary and Thyme), Louisa Lytton (EastEnders), Marcia Warren (Vicious) and Adrian Scarborough (Gavin and Stacey). The production visited Margate and Broadstairs between September and October 2013 to film on location and shoot exterior scenes including the B&B which is in Albert Terrace. The interiors of the B&B were filmed at Longcross Studios. Margate is the quintessential British seaside town, with a sandy beach, harbour, arcades, and historic architecture. The town has lots to offer, including Turner Contemporary, quirky shops, independent galleries and trendy cafes. Margate is a popular filming location, having previously welcomed productions like Mary Queen of the High Street (2013) BBC One’s drama True Love (2012), and The Apprentice (2009). Broadstairs is in East Kent offers a sandy beach, Viking Bay lined with traditional beach huts, a band stand and large Victorian terraces as well as a busy high street and many food and drink establishments. The area has previously been used as a film locations by Eastenders (2015), Bang Goes The Theory (2012) and The Fixer (2008). Don’t miss the series, which starts on 21 February 2014 at 21:00 on ITV1. This entry was posted in Filmed in Kent and tagged Broadstairs, Edge of Heaven film locations, Margate, tv entertainment. Bookmark the permalink.